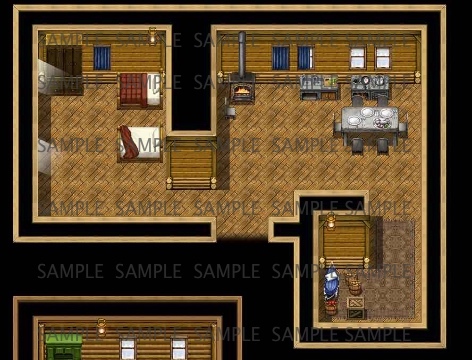 Town of Seasons - Interiors| RPG Maker | Create Your Own Game! Town of Seasons - Interior is an essential add-on pack to match with the colorful season pack Town of Seasons, a few indoor scenes can be set up in a variety of ways whether you want a cozy cabin house or a splendid luxurious home! Created by Sherman3D, this pack contains kitchenwares with different food platters that come in handy, and a special animated fireplace lets you create a scene where the characters are in an engaging dialogue for your game! Tile A2 and A4 include interior tiles such as walls and floors. Full Tile B, C, D and partly completed tile E include interior add-ons and decorative objects such as bedroom furniture, windows with curtains, living room furniture, kitchen furniture and appliences, bathroom essentials, all to make the insides maps for a cozy cabin, or a luxurious home!